This is the second time Killin’ Jack has been published, such that any of my longer-term readers have probably already read it. Its publication came as quite a surprise in the latest Aoiffe’s Kiss- I sent it in to them about 18 months ago, in January 2008. 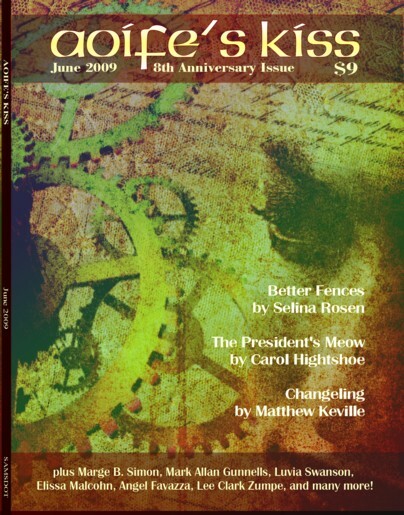 In February 2008 it sold to the online zine AtomJack for $10, and I was pleased. I did the proper thing and sent a follow-up email to samsdotpublishing (who print Aoiffe’s Kiss) to withdraw it from consideration. I heard nothing back, but then that wasn’t unusual. And now, in the past several months, samsdot have plucked up two of my stories, both of which got published elsewhere in the 12+ months since submission, and published them in their print zines despite withdrawal emails I sent to them. One was Caterpillar Man in their April 2009 edition of ‘Shelter of Daylight’, and the other now. I’m not complaining though. Now I have three print credits, wazaaaa! If you’d like to buy a copy of Aoiffe’s Kiss, do it right here. I don’t get any cashola from it though, I was paid with a contributor’s copy. Unfortunately I didn’t make the front page :(. I’m not a big enough name I suppose.